I recently decided to build a walking beam engine. I was going to make it out of wood and tin cans, I wasn't sure how it would all fit together so I made a cardboard mock up. The cardboard mock up was pretty strong, so I thought, why not just try and use the cardboard to build it ? This engine is the result. Download the templates from here. Print out the templates and check that they are the correct size using the rulers printed on the template. Glue them all to some corrugated cardboard using a glue stick and cut the out using a knife. I hot melt glued all of the cardboard parts. It should be easy to figure out where the parts go because they are all matching. Stone for the base, bricks for the tower. The "wooden" beam is constructed the same way as the base and the tower. Glue the ribs and the base piece to one of side pieces (the parts that have the white circles on). I just glued the ribs at approximately even spacing. You'll have to cut some of the card board near one of the bearing holes to allow the connecting rod to pass through. Drill a 6-8mm hole in the side of the coke can about 30mm from the top bevel. Drill an 6-8mm hole in the top of a bottle cap. Use a can opener to remove the top of the can, then cut the bevelled part off to just below the bevel of the can. You should be able to push another can into the top of the cut down can, push it down around 3 - 5mm. This is to keep the shape of the can whilst the epoxy dries. Epoxy the bottle lid to the can so that the two holes line up. The epoxy will want to run all over the can so keep rotating it in all directions until it sets up. When its dry, you can remove the other coke can, it will be used later. The displacer is my usual steel wire wool. Roll the wire wool around a pen or straw until it is about 5mm smaller that the displacer cylinder can. Cut the wire wool off at this point - rolling the cut edge into the rest of the wire wool should stop it unravelling. Remove whatever it is you rolled it around. The displacer needs to be about 2/3rds of the height of the displacer cylinder. I always find it ends up slightly bigger than the size I originally cut it to. You'll need a hook to so that you have something to tie the fishing line onto. I used a bit of copper wire, but a paper clip will be fine. The exact shape is not too important so long as it grips the wire wool. This hook is threaded through the centre of the displacer. Cut the the neck off a bottle just below the part that sticks out. Sand the cut edge smooth so it wont catch the balloon and puncture it. You need this so that the balloon can be sealed around something. I found it really hard to stretch the balloon over a bottle cap on it's own (because they are too big) so this little adapter makes it easier. Cut the neck off the balloon so that you can push the M4 bolt through. Fit an M4 penny washer to the bolt. I stretch the balloon tight over the bolt and poke it with a knife, this is usually enough to puncture the balloon. Stretch the balloon taught over the penny washer and add the another washer and an M4 nut. Tighten it up! The balloon is pulled loosely over the bottle cap. Secure it with an elastic band. You can screw the bottle back into the bottle cap now. Hold the bottle cap not the can when you do this. Make sure it's tight because you don't want any air leaks here. I used 1.6mm steel wire from a garden centre. In order to minimize friction I straightened all of the wire out using a drill. Chuck about 400 mm of the wire into the drill. Grip the other end tightly with pliers (you could clamp it in a vice too, if you wish) and spin it with the drill. Try and stretch the wire as you spin it. Don't spin it for too long as this work hardens the wire, it'll snap if spun for too long. I straightened two 400mm long pieces of wire, this should be more than enough for the engine. The cranks are very simple a single arm bent out about 6mm and about 30mm long. Make the cranks long enough to span the distance between the cardboard brick sections plus about an inch either side. I tried this engine without steel bearings and it worked absolutely fine without them. I didn't think that it will last very long with cardboard bearings though, so I made some simple metal ones out of the scraps from the cans. They are about 40mm square pieces of the cans. I pierced a hole in them with a pin and then widened it using the 1.6mm wire. Cut 3 pieces off the straightened wire. Two at about 40mm long and one about 100mm long. To connect to the displacer you'll need to make a zig zag with with a loop on both ends (the photo best explains this!) . The displacer connecting rod rests on one of the 40mm pieces of wire you cut earlier with a straw spacer. Thread this through the bearing hole farthest from the centre of the beam. The beam is off centre. It has a straw spacer either side. The space at the back is approximately 35mm and the one at the front about 20mm. The 100mm piece of wire supports the beam, it should be loose and move freely. To run well, this engine must be balanced. Tie the displacer onto the displacer connecting rod. Keep adding balancing weights (I used some coins) to the other side of the beam until it rests level. Glue the weights in place once you have it right. Untie the displacer when it's balanced. Step 9: The cap for the displacer cylinder. To seal the displacer cylinder, you'll need cap. First, you have to make a very small hole in the cap for the fishing line. This mustn't be tight or loose. It has to be just right. Personally I prefer to make a tiny starter hole with a pin then widen it using a sewing needle. But I know my sewing needles are 0.6mm and my fishing line is 0.45mm. This is just right. You can make this hole very carefully using just the pin though. With the displacer wire hole O.K, cut the can down to about 30mm tall from the base. I epoxied a bottle cap in the centre of the can, the cap has an 6mm hole drilled in it to allow the fishing line to pass through. This allow you to put cold water in the top of the engine, without it getting into the displacer cylinder through the displacer wire hole. Cut out the template for the fire tin and tape it around a coke can. Cut around the can just above the template using a knife. You need to keep the top of the can for the candle to sit on. Cut the top part of the can down just on the edge of the bevel. I pierced a hole in the fire tin opening and then cut it out with scissors. Trim around the top of the template with scissors. Push the top part of the can into the fire tin. This creates a flat surface for the candle to sit on. The fire tin is just pushed onto the base of the displacer cylinder. I taped around the fire tin and around the top of the displacer cylinder just to be sure that there were no air leaks. You can epoxy the displacer cylinder in place onto the cardboard base. The diaphragm should point towards the crankshaft. Connecting all of the parts together is a bit tricky because there isn't much space. Start by making a loop just a bit bigger than the 1.6mm wire in one of the straightened pieces of wire. This is fitted hook between the other bearing holes on the beam. This will go straight down to the cranks, connecting the directly to the beam. But before you can connect it to the cranks you must make the diaphragm connecting rod. 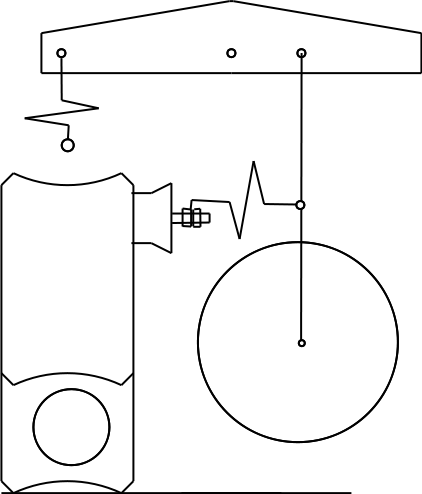 The diaphragm connector is made in the same way as the displacer connector, a zig zag with a hook at one end for the M4 bolt and hoop at the other end to connect it to the long rod that connects the beam to the cranks. I made small stops out of a straw to prevent the diaphragm connecting rod from sliding down the beam connecting rod. Thread the cranks into the bearing holes. With the diaphragm connecting rod attached to the beam connecting rod, you can form the other hoop to connect the beam rod to the cranks.